BWF-ZZ system, Geminate region. On the 12th of January at 19:00 EVE Standard Time, Drone Regions Federation (DRF) forces clashed with Project.Mayhem. [16-13] and their allies in the system. The two sides fought over a DRF staging tower. The tower had been previously reinforced by Project.Mayhem. as part of their incursion into the region, forcing the DRF to form up and defend the structure as it exited its invulnerability phase. With the bloody history between the two sides, a major confrontation was inevitable. Drone Regions Federation formed up a full Machariel battleship fleet, with a secondary Augoror Navy Issue cruiser fleet of approximately 70 pilots. The fleet had also several Minokawa force auxiliaries deployed to restore the tower’s shields. The DRF fleets had set up on the tower grid at a perch above the structure, overseeing the repairs and prepared to warp in and defend the force auxiliaries at a moment’s notice. Against this, Project.Mayhem., along with Snuffed Out [B B C] and WAFFLES. [N0MAD] formed a Nightmare battleship fleet of 150 pilots. The fleet made its way from its staging in low security space, entering through the Oijanen gate before warping to the tower. The Nightmare fleet landed close to the Minokawa force auxiliaries, opening fire on the ships. The Machariel fleet aligned towards the Nightmare fleet, when it was caught in a bombing run orchestrated by Out of Sight. [OOS]. The alliance had brought an entire stealth bomber wing to aid Project.Mayhem., and managed to execute a bombing run on the Machariel fleet. Though bruised, the Machariel fleet entered warp, landing 30 kilometers away from the Nightmares and opened fire. The Nightmares fired in return, the Augoror Navy Issue fleet landing at medium range as well and adding its firepower to the mix. The Nightmare fleet started burning away from the two DRF fleets, maintaining its distance as its tachyon beam batteries focused their fire on the Machariel fleet. The Machariels didn’t try to shorten the range, instead content to slug it out in a long range engagement, their artillery cannons able to easily answer the Nightmares’ barrages. An ugly exchange developed as Nightmare and Machariel battleships were soon volleyed off the field by the opposing fleets, the damage each fleet fielded proving too much for the logistics wing to handle. The Machariel fleet quickly resorted to bringing triage, lighting a cynosural beacon and jumping in a couple of Apostle force auxiliaries to augment its logistics wing. However, even with the force auxiliaries on field, the Nightmares were able to volley the Machariels, hundreds of laser beams firing in unison and seemingly stabbing a single battleship with their light. The Machariels kept firing, artillery cannons lobbing shells at the Nightmares, each barrage shredding a battleship. All the while, the Out of Sight. bombers kept dropping their payload on the Machariel fleet, putting further stress on its logistics wing. The bombers kept coming, time after time, executing their bombing runs with minimal losses while the Nightmare fleet kept firing without pause. Yet as the battle progressed, the two sides had kept the trade off even. Finally, after suffering from continued bombing waves and losses inflicted by the Nightmare fleet, the DRF forces retreated, warping out to a citadel while the Nightmare fleet remained on field, harassing the force auxiliaries and dispatching stragglers. However, before the Nightmare fleet could claim victory, the Machariel fleet returned to the field, having repaired and replaced its losses. Whats more, a joint Pandemic Legion [-10.0]\Northern Coalition. [NC] Proteus strategic cruiser fleet of a 150 pilots had bridged into the system to aid the DRF’s defense of the tower. Having suffered losses itself and having to content with a third, fresh fleet, the Nightmare fleet decided to withdraw. The Proteus fleet realizing this quickly warped to the Oijanen gate, the only exit route for the attackers, and set up there to catch the Nightmares. The Nightmare fleet was caught off gate, the Proteus fleet snagging a few of its ships and forcing the rest to scatter. Realizing their only path of retreat was blocked, the Nightmare fleet was given the order to disperse in the system and log off. Once the pilots had safely logged out, the Proteus fleet had no choice but to withdraw. This allowed the DRF to secure its tower and claim victory of the field, bringing the battle to a close. All told the battle lasted 30 minutes with Time Dilation spiking and subsiding throughout the fight, reaching at one point 60% but remaining around the 80-90% range mostly. 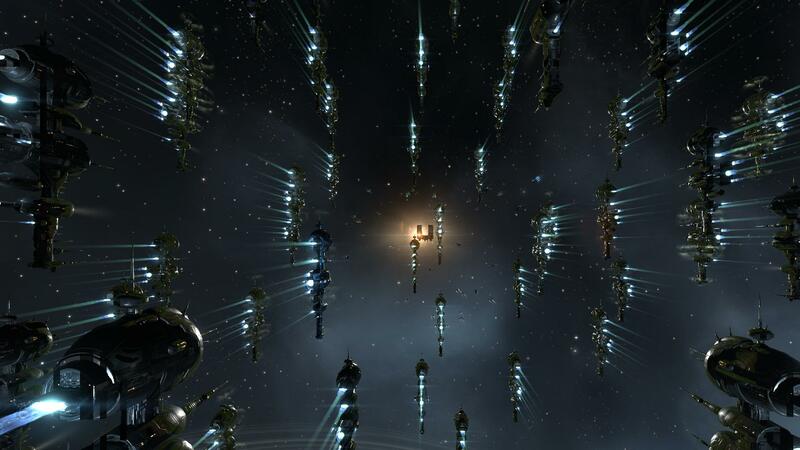 The system itself hosted 700 pilots near the end of the fight. Project.Mayhem. and its allies lost 82 ships in the fight, including 69 battleships for a total of 43.26 billion ISK damage. The DRF lost 95 ships all told, with 53 of them being battleships. The sum of ISK damage done to it stands at 33.88 billion. OYKuUu This blog is really entertaining additionally amusing. I have picked up a bunch of helpful advices out of it. I ad love to come back again and again. Thanks!